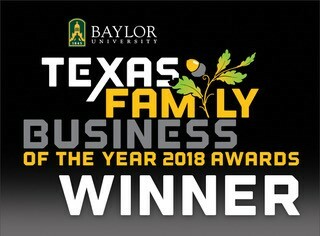 Baylor University’s Hankamer School of Business selected Electro Acoustics as the 2018 “Well Managed Business of the Year” among Texas family businesses! It is hard to believe that the little company Sue and Chris Jordan started out of their garage 35 years ago would be selected for this type of honor. Our driving desire has always been to conduct business in a way that is honoring to God. This means creating a culture that enables our team members to thrive, delighting our customers by being a trusted partner, and demonstrating daily our core values of Stewardship, Craftmanship, Relationship, and a Positive Get It Done Attitude. This award is all about families and the value family businesses bring to the marketplace. Family businesses bring a long-term perspective that can be lacking in publicly traded companies. Electro Acoustics is in transition from the first generation to the second under the leadership of Luke and Sam Jordan. Our commitment to honoring God through business will endure for future generations. We exist to serve our customers. This award is the result of the opportunities they have given us over the decades. We especially thank our many customers over the years who have faithfully stayed with us. We would not be an exceptional company without them! We are also very grateful for their grace and patience for the times we were not so “well managed.” We will strive to do our best to be worthy of this award.